Following the termination of an emotional affair with a co-worker, Simone, Jonathan turns first to a bottle of Jack Daniels and then to the maternal security of his wife’s sister Joan in order to dull the pain of a loveless marriage to Claire and his longing for Simone. Simone is also in a loveless marriage to a man who abuses her and she turns to other means of “medicating” away her pain. Joan is a never-married, businesswoman whose life runs on a strict schedule, which is her way of avoiding being drawn too deep into a relationship. 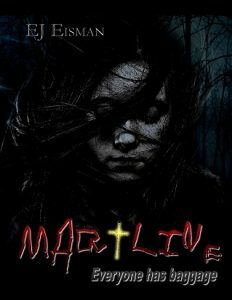 Claire has turned the abuse that she experienced in her first marriage around and directs her hurt toward Jonathan, who is too weak to resist her abuse. As the story continues, the psychological factors revolving around each of the players play their part. Each finds that they run the entire gamut of emotions and escapes, searching for an answer to their inner turmoil. The twists and turns will eventually lead to an answer. Whether desired or not, the consequences of their actions will come back around to each one unless they do something to stop the downward spiral. In E.J. 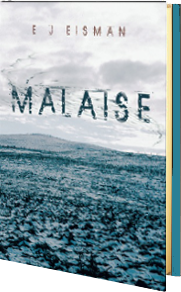 Eisman’s book Malaise, there is a picture of cause and effect clearly portrayed and brought into the light. As each character in the story searches through their own psychological reaction to the world and the relationships around them, they are continually given new opportunities to change and are continually experimenting with different ways to escape, while still doggedly holding onto the very things which are destroying them. This is an excellent look into the reality of relationships which are abusive on the one hand and submissive on the other. The reader will feel themselves moving through each aspect of the relationships and examining, judging, and perhaps even finding themselves wanting to give each a good talking to or a sound slap in the face. This is an excellent read for someone who enjoys exploring the human psyche. It’s the kind of book that will stay with you for days as you wonder about what it says about human nature, society, and the future of society. A quiet, sorrowful, deeply moving exploration of the powers of empathy and the obligations of love. Not only do the characters develop but the author also develops as descriptions, sceneries and environments become more descriptive and exact. Definitely worth reading and re-reading. Eisman is one of those rare writers who can craft stories as meaningful as they are enticing. 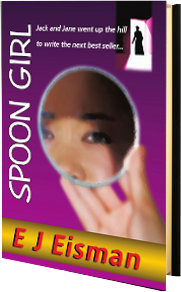 Spoon Girl is an intriguing story that captures the readers attention from the very beginning and delivers them to a delightful twist of an ending. In Jack, Eisman’s main character, we see a wounded soul struggling to recapture his desire to write and his ability to duplicate past literary success. Self-doubt, alcohol abuse, and an undeniable affection for Spoon Girl threaten to destroy this cynically likable character. I found myself rooting for Jack to succeed! Great characters, engaging story, unexpected twist at the end…what’s not to love? Was a very good book! I did not see the ending coming at all well worth the time to read. This was a unique book with complex likeable characters. Not a quick I know the ending writing but one you have to finish and can’t wait to fit all the pieces together. A enjoyable read and one I will add to my library. There were a few typos or uncorrected words not caught but it did not interfere with me wanting to keep reading. Spoon Girl deftly intermingles a ghost story, a love story and a drunken misogynist author into a sad and funny look at a writer that has trouble writing after his first novel becomes a huge success. The author, “Jack” McVoy is searching for the magical thing that would get him writing again and winds up slowly killing himself with Jack Daniels and cigarettes. In the hospital he meets up with a writing student he taught (who just happens to be his nurse). With her brilliance and perseverance they are able to finish his novel, about a lost love, Spool Girl. The story starts out with his nurse, now turned writer, at a book signing in New York. Jane Powers, now living the life of her mentor, with alcohol and cigarettes getting her though her day, is broadsided by Jack’s lost love (Spoon Girl), Lisa, who is there to meet Jack unaware that his has died. Told mostly in first person, first, we are in flashback into the mind of Jack being admitted to the hospital presumably for alcohol poisoning. From there we jump back and forth in time to his teaching creative writing where he meets Lisa to when he dies. Along the way Jack brings tries to redeem himself from his miserable existence that pushed women and the rest of the world out of his life. There is a cute little twist at the end that you might not expect. A quick read and that is hard to put down once you jump on his life’s roller coaster.